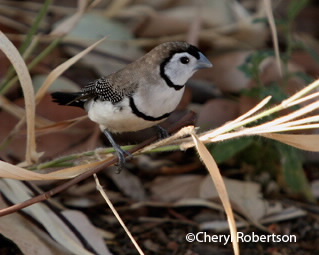 Another small grass seed eating bird, they are easily recognised by the double black bars on the chest, and the white face is bordered by a black area. Wings are black and spotted with white, tail black, underparts pale brownish-grey. Legs and feet grey, eyes black, bill grey-blue.